SharkStopper® uses the latest acoustic signaling and sound technology to create a virtual wall of sound protection that sharks will not penetrate in the open-water. 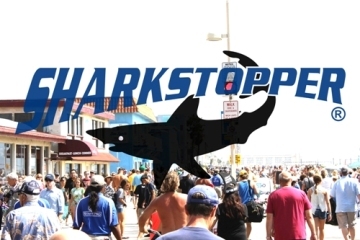 The SharkStopper can also help in the protection of sharks by targeting them with a harmless and humane signal. Long Island, New York – August 15, 2014 – “It’s safe to swim in the ocean once again,” says SharkStopper President and Founder Brian Wynne proudly. “Simply attach the device anywhere below your knee and sharks will avoid you”. “The reason you attach the device below the knee is because sharks have been known to attack in as little as two feet of water, especially Bull sharks”, added Brian. SharkStopper is the culmination of years of research, design changes and the testing of different frequencies on multiple species of sharks around the world. To prove its effectiveness, Brian enlisted the services of shark expert and Marine Biologist Dr. Shawn Larson who successfully tested SharkStopper at the Seattle Aquarium against Spiny Dogfish sharks. Brian didn’t stop there. SharkStopper was also successfully tested using additional frequency algorithms against Great White sharks in the Isla De Guadalupe, Mexico under the supervision of renowned shark expert and handler Patrick Douglas and his team from Shark Diver, as well as renowned great white shark expert Ralph Collier of the Shark Research Committee. Additionally, the SharkStopper team traveled to Haleiwa Hawaii and worked with local shark expert James Hall who successfully tested various acoustic frequencies against the Tiger and Galapagos sharks. SharkStopper works by emulating the sounds of Killer Whales in conjunction with SharkStopper’s patented frequency overlay. SharkStopper’s frequency, combined with sharks natural fear of killer whales is what keeps the sharks away. In addition to the sharks mentioned above, SharkStopper proved effective on Caribbean Reef, Lemon, Sand, Nurse, Thresher, Black Tip, Hammerhead, Bull and the Great White. The SharkStopper device is a durable, lightweight device about the size of a smartphone and powered by a rechargeable battery that easily straps to a person’s ankle. SharkStopper activates automatically once its sensors are immersed in water. “We’re in our final development phase before going into production,” said Brian. “But first we will be launching a Crowdfunding campaign on KickStarter. The Crowdfunding campaign will provide the funds necessary to bring a shark repellent that truly works to market”. SharkStopper’s Brian Wynne is a lifelong open water enthusiast who enjoys water skiing, swimming and snorkeling with his wife and two daughters. His love of the ocean led him to create a product that helps provide protection and peace of mind for those like him who want to enjoy the open waters safely. Just as important as protecting people from sharks, Brian developed SharkStopper to protect sharks from people. It is estimated that as many as 100 million sharks are killed every year out of fear, sport, and cuisine; certain species of the shark population have been reduced by upwards of 90% over the last 50 years. Brian Wynne is the President and Founder of SharkStopper LLC. His SharkStopper Personal Shark Repellant (PSR) has been granted four patents and the name “SharkStopper®” was also granted a registered trademark.